Certain candies catch my eye during the holidays that I normally avoid consuming throughout the regular year. Why? Well, by the time you gulp down whatever candy you just bought, chances are it has been sitting on a shelf for quite some time. I mean, I always see gas stations stocking limited edition bars made years ago. However, since holiday candy is seasonal, youâ€™re more likely to purchase a product that is fresher. And with the rare exception, candy tastes better the less it ages. 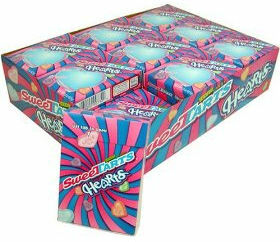 So while perusing the Valentineâ€™s Day candy aisle at Walgreens, I spotted Wonkaâ€™s SweeTARTS Hearts. Actually, it was pretty hard to miss them with the festive packaging of blue and pink swirled in a very Wonka style. If I can find fresh SweeTARTS, I usually enjoy them, so I figured there could be great potential in these. Plus, they only cost 50 cents. Once upon a time, Just Born’s Marshmallow Peeps were strictly an Easter candy, and they garnered a huge following, as evidenced by the amount of websites and articles devoted to them. Naturally, Candy Addict has already collected a lot of those links. Within the past few years, Peeps have been popping up all over the place. There are ghost and black cat Peeps for Halloween, stars and tree Peeps for Christmas, even patriotic Peeps for the Fourth of July. 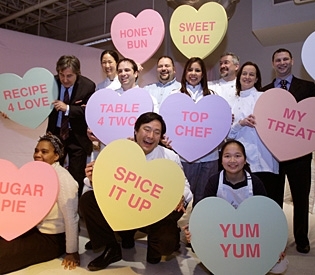 And there are Valentine’s Day Peeps for February 14th. If you’re looking for something a little different to give to your sweetie, then Peeps might be a good alternative to the standard box of chocolates. 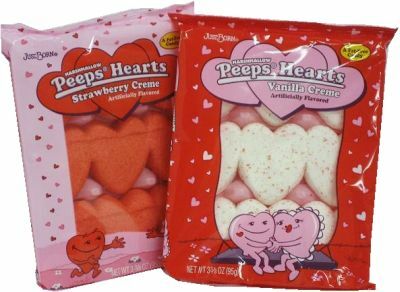 This year, they have Vanilla and Strawberry Creme flavored Hearts, regular marshmallow Pink Hearts, and a Decorating Kit, where you can personalize 4 Peep Hearts with cake icing. But what really impressed me this year is their offer of recipes and craft projects with Peeps as major ingredients. Check out the Peeps I Love You Bouquet, Sweetheart Lollipops, and Strawberry Cupcakes. Complete details are on their website, but as the entire thing is in Flash, I can’t link directly to the actual page. Just click on Valentine’s Day or check out the Featured Recipes and Crafts section for full instructions on how to make those nifty Valentine’s Day gifts.